Reasons Why Triton, Neptune's Moon, is One of the Coolest Moons! Home » For Your Information » Reasons Why Triton, Neptune’s Moon, is One of the Coolest Moons! When I think about moons in our solar system I usually go for the favorites like, Jupiter’s Europa because of its mysterious hidden ocean beneath the crust, or Saturn’s moon Titan being one of the only moons with a dense atmosphere. However, one planet and moon that never gets in the spotlight is Neptune’s moon Triton! It’s arguably one of the coolest hidden gems in our solar system, and I’ll tell you why. 1 ) Triton is one of Neptune’s largest moons and is the only large moon with a retrograde motion, which means it orbits in the opposite direction of the planets. Sure, it’s cool to know that this moon is a rebel and orbits the other direction but what’s really neat is astronomers believe because of its retrograde motion Triton may have come from the Kuiper belt. 2) The surface on Triton is mostly made up of frozen nitrogen and mostly ice water crust. About 15-35% of Triton is made up of water ice. 3) Even though Triton hasn’t been visited by one our spacecrafts since Voyager 2 in the 1980’s, we did discover something very interesting. Triton has active icy volcanoes! That’s right, an icy volcano! Astronomers believe this is likely taking place on it’s surface when they observed several geyser-like icy volcano vents that were spewing out nitrogen gas laced with extremely fine dark particles. 4) One of my favorite predictions of Triton is what happens in 3.6 billion years. It’s definitely a long ways away and humans won’t be around to witness this, but maybe something related to humans may get the opportunity. Astronomers noticed that Triton is actually much closer to it’s parent planet Neptune than our moon is with Earth. In 3.6 billion years Triton will pass through Neptune’s Roche limit which will either lead to a collision with Neptune’s atmosphere or the break up of Triton forming a ring around Neptune just like Saturn. 5) It appears that a large portion of the surface has melted on Triton. NASA suggests that it is probably because when Neptune captured Triton it caused tidal heating which would have left Triton a liquid ocean for at least one billion years (obligatory pinky in corner of mouth expression). 6) Astronomers discovered that the atmosphere on Triton changes with the seasons. The Very Large Telescope in Chile observed Triton during its summertime in the southern hemisphere, what they found is the suns warmth actually thickened the atmosphere! 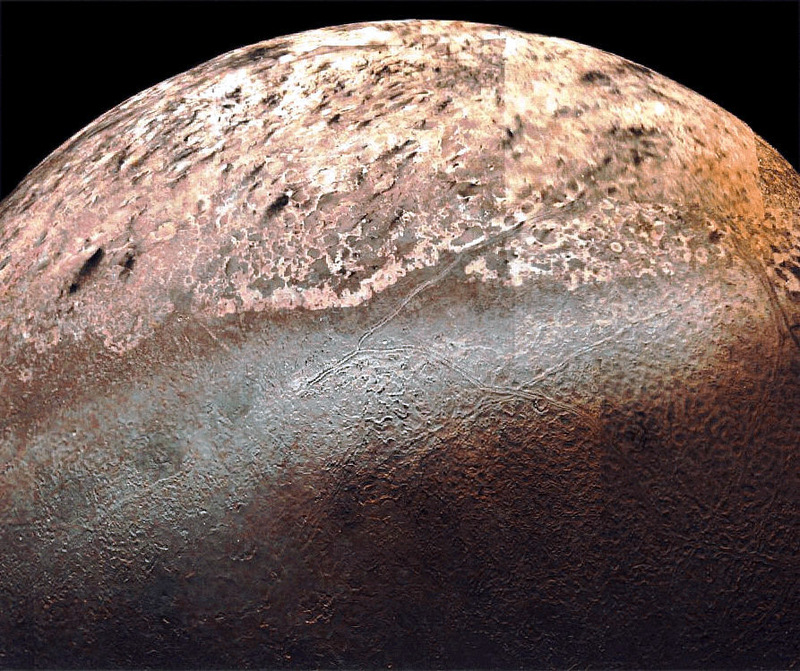 8) Triton is slightly larger than Pluto but share very similar makeup. Scientists believe that since both Pluto and Triton share similar composition that they must have very similar origins. 9) The temperature on Triton is so cold (how cold is it!) that it’s colder than even Pluto’s average temperature of -229 degrees C compared to Tritons -237 degrees C.
10) The surface of Triton is relatively young when astronomers discovered that it had hardly any impacts from passing meteoroids or other space debris. Astronomers found that there were only 179 craters caused by impact, whereas on Uranus the moon Miranda has 835 craters and only has 3% of Triton’s surface area. 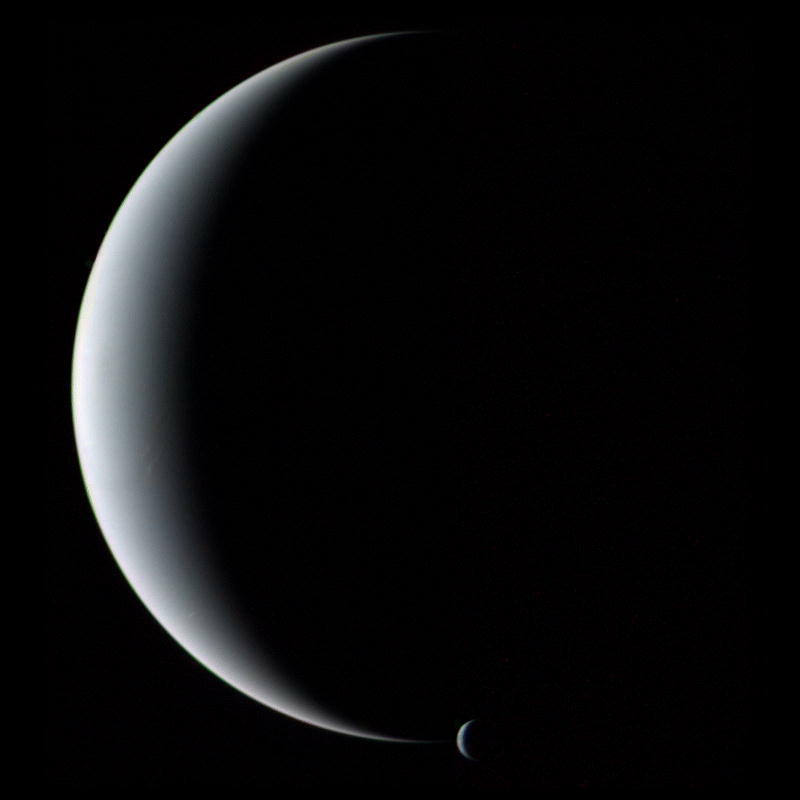 Here’s a lovely image of Triton paired up with Neptune, taken by NASA’s Voyager 2 spacecraft in 1989.